Description: 16 pages, 8x11, three color offset, mail order ads and information, sample copy $ 2.50, ads 1" $ 8, 20 cents per word. 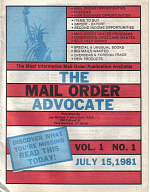 MOA was merged into The Enterpriser already in Feb 1982 !!!! Visit Signal's website * 1.000.000 hits in 18 years * now 3.800 pages * 50.000 penpals worldwide * your ad FREE !